Flat cutting edges that do not place any load on the body of the component while cutting precision component lead wires. For cutting the IC leads when removing IC components. 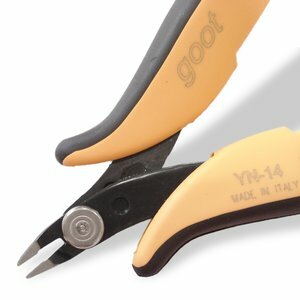 Held in the reverse manner to standard nippers, the YN-14 cuts the flat IC leads that face away from the user. Use for cutting copper wire only. Max. cut diameter: 0.6 mm.